This is a simple machine that I use frequently. It is loosely based on the Enigma algorithm. You simply print it, cut it out and use it. It is easy to make, use and hide. Because it is so simple to make, you could burn it after each use, printing another one when you need to encrypt or decrypt another message. Of course, make sure you keep the key somewhere safe. Print out the page on stiff card-stock. Cut the 5 strips and cut slots in the sheet as shown for the strips to slide through. Insert the strips across the page into the slots on each end and encrypt a message as shown. 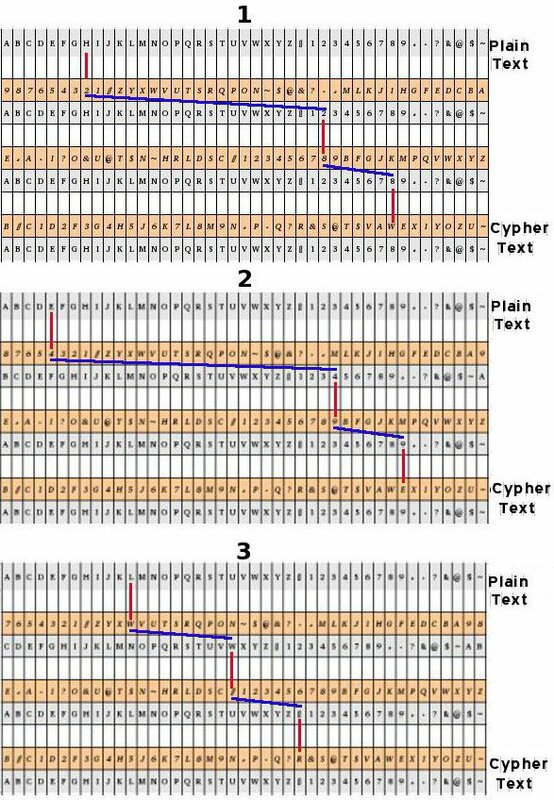 To encrypt a message, choose 3 of the 5 strips and insert into the slots. The choice of strips, along with their order and starting position of each strip is the key. (see illustration below) In the example, the strips are V, IV, I and the starting position (orange character lined up under “A” on the top gray alphabet) is 9, E, B. Note: although the example uses the 1st character on each strip, the key can start at any character. Each strip has 2 alphabets end-to end. This allows use of the entire alphabet without having to slide strips back and forth for consecutive characters. As an example, let's encrypt the word: HELLO. Find the plain-text:H (the actual message) character on the top row . (#1 in the illustration). Follow the lines. Take the character on the orange of the first strip directly below  [red line], and locate that character on the gray portion of that strip [blue line]. Repeat that step with the middle strip . On the 3rd strip, the cypher text is the character directly below on the orange W. W is the cypher-text for H.
Now slide the top strip (#V) 1 space to the left (start position: 8). The other 2 strips (#s IV & I) don't move. Repeat the encryption for the E to get cypher-text E. (#2 in the illustration). Notice that some characters will encrypt to themselves. This is good. Now slide the top strip 1 more space (start position: 7) and repeat again for L (#3 in the illustration) to get cypher-text R.
Continue for the remaining letters. The complete cypher text is WERN0. On my encryptor, I use the alphabet, the 10 digits and 7 non-alphanumeric (nac) characters. I use the “~” character to designate a space. The message: MEET AT THE BRIDGE AT NOON would first be written as: MEET~AT~THE~BRIDGE~AT~NOON. This gives all spaces in the message a printable or written character. The rest allow more precise communication, and allow more word substitution like "@" for "at". Such substitutions, combined with irregular spelling and a lack of standardized message structure serve to complicate cryptanalysis. To have a unique set-up, you can insert different cypher alphabets and/or more strips for even more-and different keys. I use 43 characters. You can make a new strip slide with more or less characters and have a completely different cypher. Once you have gone through the entire character set on the first strip, move it back to its original position and advance the middle strip one character. If you have a long message, do the same with the bottom strip. This gives you 79,507 positions before repeating. Along with the 60 possible strip position choices, that is 4,770,420 possible keys. Quick to make, easy to carry and use and strong enough encryption to foil all but the most dedicated of foes. To exchange an encrypted message with someone,you can either exchange keys in advance, or agree on a method of hiding the key within the message. Here I simply added 1 to the number of each strip and took the letter following the actual starting place, then placed it at the beginning of the message. Use your imagination here. Once you determine a good method to encrypt and transmit the key, that's all you have to remember. No keys list to distribute. 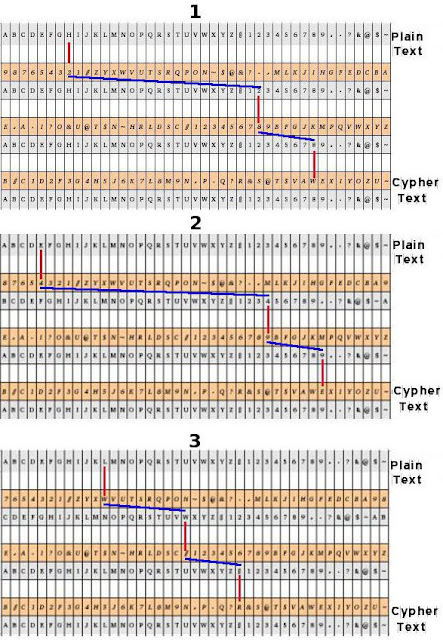 You can then use a different key with each message making cryptanalysis almost impossible. Your intended recipient (or a foe) must have both the slide-strip and the key to be able to read your message. Leave the foe out of the loop. The encryptor without the key is all but useless to decrypt the message.